Yamuna, like most water bodies at Indian cities is naught but filth. Pollutants from all sorts of places are dumped into the river as if it were a garbage can. Delhi was established on the banks of Yamuna and so it stands to this day, only now the river takes what we don't want quite unlike earlier when people had settled here to take what the river gave them. Sometime back, I'd seen this investigation of the Yamuna at the four bridges in Delhi that it went under. Water samples at the four bridges in order of their occurence were: yellow -> greenish blue -> dark blue -> oil. But then we have our government to take care of that, don't we. The Muncipality says its the Delhi state Government's responsibility who say its the U.P. Government's undertaking who declare it to be a major problem and thus want the Central Government to take over the matter who would ultimately turn to the city municipality and it flows on. 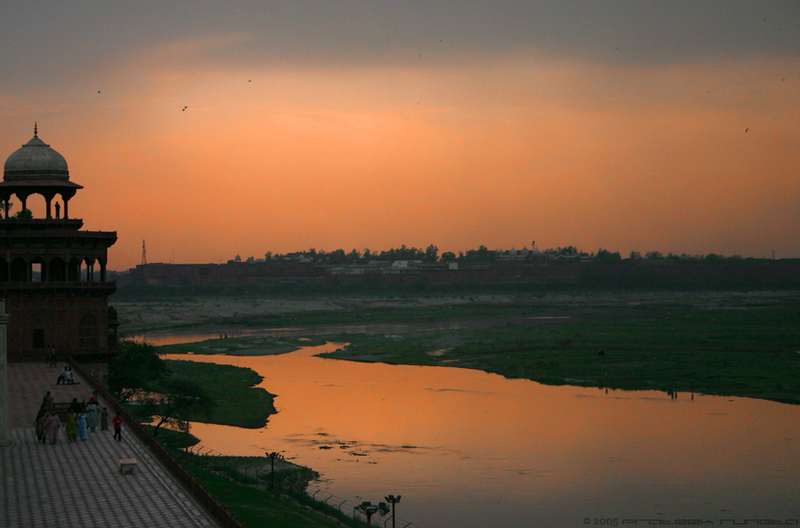 This, however, is a picture of the Yamuna at Agra, about 250km (155miles for you non-metric types) south of Delhi. Aside from being beautiful and interesting, I wish to especially thank you for doing the conversion to standard from metric. It often makes my brain hurt to have to do this myself. This is truly a great service to your readers and will, no doubt, increase your web traffic 100 times. You may find yourself in trouble with your ISP for the increased traffic, but it was worth it! The metric conversion is pretty simple all you need is an apple comp with Mac OS 10.4 in it. Thats how's Prateek has managed. dont go on thinkin he can do the conversion otherwise. What a great, big fuss you people make! I mean, find me one person who CAN'T do division by 1.609344 in his head? hey it looks more like a garden.hehehe. still it looks neat & plesant.